Medicare Supplement Plan C, also known as Medigap Plan C, is the second most comprehensive plan (after Medigap Plan F). It covers all Medicare ‘gaps’ except for Medicare Part B Excess Charges. Like all Medigap plans, Medicare Supplement Plan C is standardized, i.e., its benefits from one insurance company are the same in comparison to any other company. However, premiums may be very different. 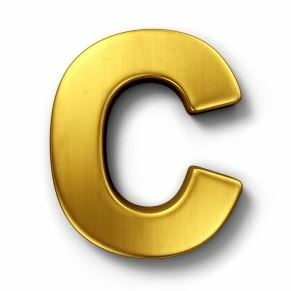 Not all Medicare Supplement insurance companies offer Plan C. Some companies offer only one of the two most comprehensive Medicare Supplement plans: Plan F or Plan C.
What does Plan C not include? When is Medigap Plan C the right choice? Hospital Costs: Medicare Part A coinsurance and 365 additional days after Medicare benefits end. Medical Expenses: Medicare Part B coinsurance (typically 20% of expenses that are Medicare-approved) or copayment. Blood Coverage: The first 3 pints of blood per each calendar year. Hospice Care: Medicare Part A coinsurance/copayment. Skilled Nursing Medicare Part A coinsurance (20% that Medicare does not pay for nursing facilities). Medicare Part A Deductible (for 2019 the deductible is $1,364 for each benefit period). Medicare Part B Deductible (for 2019 the deductible is $185 per year). Foreign Travel Emergency (up to Plan Limit), consisting of Medicare coverage outside of the US. Medicare Part B Excess Charges, meaning charges from doctor’s that are above the Medicare-approved amount. It cannot exceed 15% of what Medicare pays. When is Medicare Supplement Plan C the right choice? 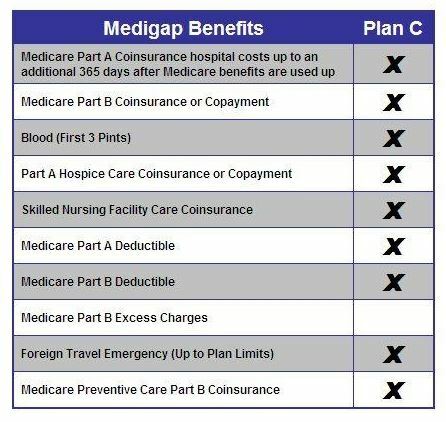 Medigap Plan C is identical to the Medigap Plan F; however, it does not include Medicare Part B excess charges. In states where Excess Charges are illegal (e.g., Pennsylvania and Ohio), there is no reason to buy the more expensive Plan F, because Medicare Supplement Plan C will suffice. Since 99% of doctors accept Medicare Assignments, the need to cover Excess Charges is very small even in States where they are allowed. Use Medicare Supplement Plan C (if available) when you are looking to save money on Medicare Supplement Plan F by dropping its Extra Charge coverage. Starting in 2020, Medicare Supplement plans will no longer sell NEW Medicare Supplement Plan C. Congress has decided that new Medigap plans will no longer be allowed to cover the Part B deductible after January 1, 2020, and it affects Plan C. Anyone enrolled in a Medicare Supplement Plan C as of 12/31/2019 will be “grandfathered” and able to continue with their plan (including coverage of the Part B deductible) as long as they want. How to Compare Medigap Policies? With the 10 Standardized Medicare Supplement plans made available, it indeed becomes a difficult task when selecting the right plan for you and your medical needs. Not all Medigap providers carry all of these plans, and the difference in premiums for the same type of plan among different vendors may be substantial. Use the Liberty Medicare expertise to your advantage and seek out the Medicare Supplement plan that is best for your needs and budget. All our services are absolutely free to you! Learn more about all of the benefits of working with Liberty Medicare. Get a free Medicare Supplement Insurance Quote, or call us at 877-657-7477. Our specialists are ready to answer your questions.